If you have issues with the temperature at night or have night sweats that significantly affects your core body temperature, then you’ll be interested in learning about a unique sleep gadget called the BedJet. The BedJet is a Bluetooth temperature management device designed to provide sleeping partners with optimal conditions. The device sits under the bed and regulates a special sheet. The temperate can be adjusted from low to high, warm or cold. A remote control allows you to adjust all the settings on the BedJet. Imagine, never having to get out of bed to adjust the thermostat regardless of the weather! With the cold setting, you enjoy perfectly cool temperatures all night. With the warm setting, you instantly warm up cold feet and legs, allowing you to do away with extra thick winter blankets and uncomfortable nights. With a single BedJet V2 and a Dual Zone comforter, you can cool or warm one side of the bed without disturbing the temperature of the other side. The Dual Zone comforter creates two separate zones within the sheet. With a full BedJet V2 Dual Zone Climate Comfort System (two BedJets and a Dual Zone comforter) you can cool or heat both sides of the bed simultaneously. I initially came across a review of The BedJet and was pleased to see it so highly rated online. As a result, I eagerly placed an order and awaited its arrival. To begin, the product is so easy it doesn’t even need to come with a specific set of instructions, which is great! I got a little lost when it came to some of the parts, but that was easy to resolve as BedJet has an instructional video on their website which answered all my questions. When I figured out the correct way to set up the device, the whole family was eager to play with it to see how it works. I have the Dual Zone sheet, which is designed to attach seamlessly into the BedJet fan. With the attachment in place, the sheet fills up with air and looks like a big puffy air-filled blanket, which is quite a novelty. My children certainly enjoyed checking out this new product as it was something we have never seen before. In fact, I doubt whether most people have seen something like this before, but with its solid reviews no doubt they will discover it in time. It was quite amusing to have a blanket full of air because I have a SleepNumber bed, which is too filled with air. It seems like the perfect combination for those who appreciate a bit of air in slumber. Upon first touch, it felt very cold which is great because I had my doubts. On my first night, I tried out the maximum setting for an hour, and while I was freezing under my blankets, my wife on the other side of the bed didn’t feel much except for a slight breeze. The maximum coldness was far more then I could handle. On subsequent nights I started realizing that the bed feels more comfortable with the BedJet on. It’s a luxury item – beyond the cold or hot functionality, you get a fluffy cloudlike wind floating over your body every night. It’s also convenient to use. The product is easy to control via remote, which allows you to adjust your temperature right from your sleeping position. There is nothing more frustrating than having to get up at night, and the design of the BedJet control addresses this efficiently. It’s a great viral product. It seems that everyone wants to know more about this product as soon as hearing about it, because what could be more unique than sleeping under a cool or warm pillow of air? I always find myself telling people about this device in everyday conversation, and people might be curious enough to go and buy one for themselves. The unit hides under the bed, so it is not a trip hazard. You don’t want to fall over it or have your partner fall over it while going to the bathroom at night. Sometimes the tube gets in the way, and I hit that when I am getting in and out of bed, but it isn’t a major problem. As with every product, there are a few minor drawbacks. First, the spot where the BedJet blows into the sheet is colder than the rest of the sheet. If you don’t like cold feet, this might bother you. It wouldn’t turn me off from buying the product, but it is something to be aware of that you’ll probably have to keep your feet clear of that spot if you’d like to avoid getting too chilly. You could possibly wear socks to bed? Second, it’s slightly noisy on the higher settings. Not too noisy – quieter than a Dyson fan. But, if you are a light sleeper, perhaps the BedJet will be good if you only intend to use it on the lower settings. Heavy sleepers shouldn’t have a problem with the high settings, but it might bother your partner if he or she doesn’t have the same sleeping characteristics. I often toss and turn during the night, which means the sheet can come unattached. I have to re-attach and button up the sheets with the BedJet engine every night. However, this isn’t such a big issue, but it is good for you to know as a potential customer that it isn’t 100% automated and easy to use. Overall, I have to say this is the ultimate luxury in sleep. Some people in developing nations sleep on the ground, with no bed – let alone air conditioning, and I have a luxurious machine that blows cold air into a sheet so I can sleep in the optimal temperature for my needs. Completely frivolous! It feels wonderful to sleep cold all year round. I normally have a fan running, or the A/C, but this product is a whole new level of experience. With a guaranteed continuously cold sensation, there is no chance of overheating, meaning a better quality sleep. 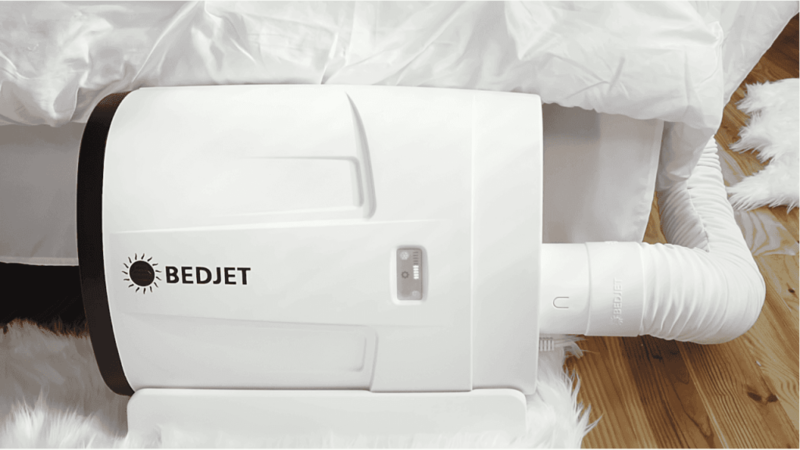 If you are constantly waking up with temperature issues, why not consider a BedJet today?